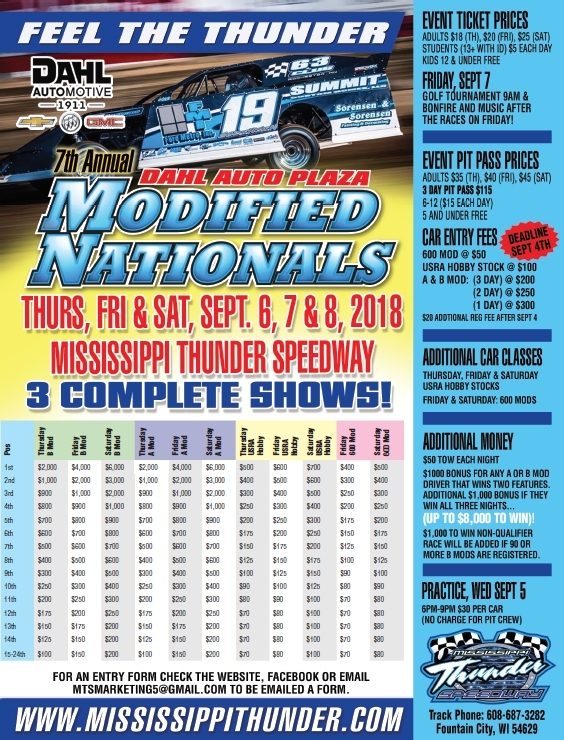 The 7th Annual Dahl Auto Plaza Modified Nationals are just around the corner, and excitement is growing as new information, new pay scales and new driver additions continue to build the anticipation for this once-a-year spectacular. This year's show will be a three-day event with full programs every evening. USRA Modifieds and Out-Pace USRA B-Mods will joined by Cook Racing Supplies USRA Hobby Stocks all three night. Thursday night will be $2,000 to win and $1,000 for second. Friday night will now be $4,000 to win and $2,000 for second. Saturday will pay $6,000 to win and $3,000 for second. In addition there will be a $1,000 bonus to any driver that wins two of the features and another $1,000 bonus if that driver wins all three features. A weekend sweep would see that driver go home with $14,000. On top of the unmatched posted payout, additional money includes $50 tow each night, plus a $1,000-to-win Non-Qualifiers Race will be added if 90 or more Out-Pace USRA B-Mods are registered. All three days of the 7th Annual Dahl Auto Plaza Modified Nationals will award Summit USRA Weekly Racing Series national points for USRA Modifieds, Out-Pace USRA B-Mods and Cook Racing Supplies USRA Hobby Stocks. Thanks to some overwhelming sponsor support, no USRA temp licesnes are required. Pre-registration is $200 until Sept. 4. 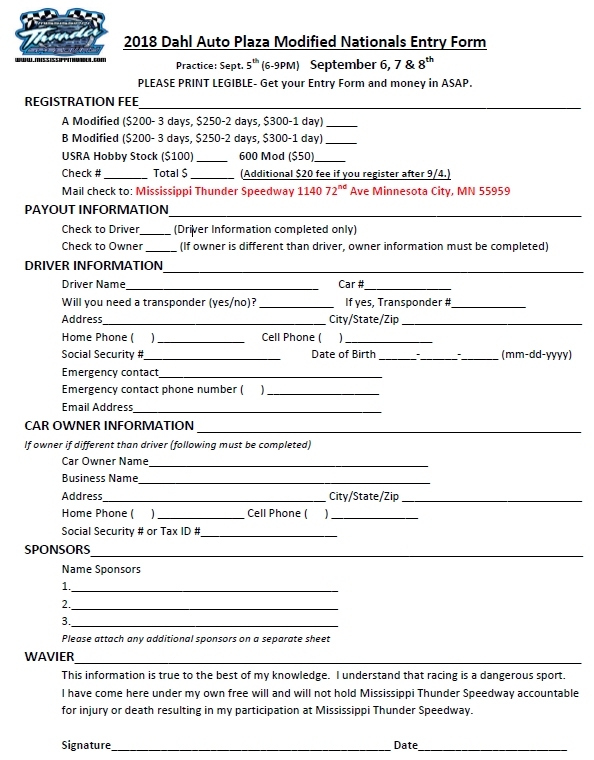 Any driver that signs up for the three-day show after Sept. 4 will have to pay an additional $20. Click here to view or download the entry form. Click here to view or download the official rules. Click here to get the latest news and information.